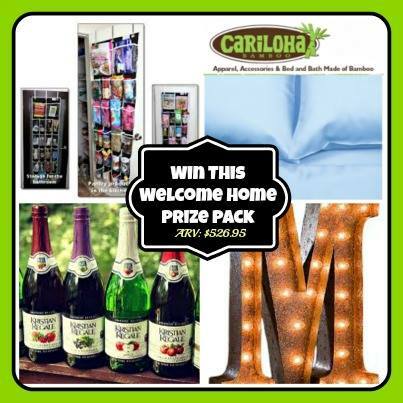 One Lucky Winner will receive a Welcome Home Prize Pack that’s sure to roll out the red carpet! Wow what an amazing giveaway with so many wonderful and high value items there is something for everyone in the family in this giveaway. I personally love and have myself the bamboo sheets and the vintage marquee light but I would love to have all these items! Well here’s your chance enter now! Dina Newman of Organizing, Concepts, & Designs™ and the creator of Stock-It-Pockets understands organizing as well as the need for high-quality and attractive options. The Stock-It Pocket over the door organizer is not only high-quality and durable, it is also versatile. With the holidays coming, it would make a perfect gift for someone on your list, as well as a great way to organize your own home. Cariloha – Stay Cool, Wear Bamboo! Clean & Green: Bamboo is naturally antibacterial, hypoallergenic and the most sustainable resources on the planet. Kristian Regale Sparkling Juices use only the finest, natural ingredients. Inside the beautiful bottle you’ll find ingredients like Geranium Botanicals, Natural Fruit Juice, two-thirds LESS sugar, no preservatives and no alcohol or Caffeine! It’s a celebration that is good all around. Vintage Marquee Lights are are designed to echo American freedom and artistic spirit. Born and raised in San Antonio, Texas Jerrad Green and his wife, Machel, originally from Myrtle Beach, South Carolina, are the creators behind these beautiful creations. Connect with Vintage Marquee Lights’ Facebook Page for more fun. It’s a Prize Pack with an ARV of $562.95!! I would most look forward to coming home to the Marquee Lights….I would feel special. OMG I love all of this!! The sheets are probably the best!!! The sheets 🙂 We could use a new set. The sheets! I so need these! I think a A Vintage Marquee Light would be great to come home to. Thanks. I think the sheets would be fabulous. Thanks for this awesome giveaway!! I’d love to see what bamboo sheets feel like! Awww..the sheets!! I love good sleeping sheets! i would love the Cariloha Bamboo Sheets. The letters are neat but I think I would enjoy the sheets. No doubt the cariloha bamboo sheets. I’ve wanted bamboo sheets for quite some time so they would definitely be my top choice. I’d love the Bamboo sheets. The Cariloha Bamboo Sheets would definitely be the sweetest gift. They are all great but I LOVE bamboo sheets! How did you know that I just got home. Right now that cider is sounding pretty good! I would definitely say that the sheets would be the best. Would love to try the bamboo sheets. The Vintage Marquee Light would be great. I would love to see those as soon as I walk in the door! I LOVE the marquee lights! So cool! The Marquee lights would make me feel like a star! Being welcomed home with a set of Cariloha Bamboo Sheets would be my most outstanding welcome home ever. Cariloha Bamboo Sheets would positively be my outstanding welcome home surprise ever. My favorite would be the awesome Cariloha bamboo sheets! It’s been years since we have had new ones. Thank you! For me, the sheets most definitely! I would love to try the bedding. I love the sheets and the sign. Cariloha – Bamboo bedding. Heaven!!!!! I have wanted sheets from Cariloha FOREVER! I love bamboo fabric!!!! Love all the prizes, but absolutely love the Cariloha bamboo sheets….never had bamboo before…..
Iike the light but need the sheets. I need the sheets, but like the M lights. The Cariloha Bamboo Sheets sound wonderful! Looks like I’m with the majority on this one: the bamboo sheets for sure! Been wanting to try some. They sound very inviting! The bamboo sheets sound divine! The marquee light is fabulous!!! I really think that any of the items would make coming home the best! However, the sheets would probably make crawling into bed super comfy! I woud love the sheets! The Cariloha sheets! I need new sheets. I think the Cariloha Bamboo Sheets would make coming home wonderful! I’ve been wanting bamboo bedding and clothes. I would love coming home to those Bamboo Sheets. The sheets. I’ve always wanted to try bamboo sheets! The sheets would be my favorite. The Cariloha sheets would be my favorite to come home to. I really wanting a marquee sign for my mantel! I would love A Vintage Marquee Light–36″ Letter of Winner’s Choice. They are all wonderful but it would be the Cariloha Bamboo Sheets for me! I really need the Stock-It Pockets!! I like the sheets most of all. The Bamboo sheets are my favorite. I would like the sheets! I hope to win! My most favorite item to come home to would be the Cariloha Bamboo Sheets. Great sheets makes the bed feel wonderful. I Bamboo sheets, definitely. They are so soft and comfy. I think Cariloha could make coming home very comfy. I think I would love coming home to those sheets. Slipping into the cariloha bamboo sheets would be the best homecoming ever. I would love to win the organizer. I’m in love with the Vintage Marquee Sign! I would love this! Thanks! The cariloha sheets are my favorite! I having been wanting a set of bamboo sheets since they came out with them. Bamboo sheets. They sound great. Definitely the bamboo sheets. I’ve heard so much about them and would love to have a set. Definitely the sheets anything cool sounds good in Arizona! I’d like the bedding most. Talk about making bed time even better! I would love the sparkling juices; wouldn’t they be lovely and refreshing after a long day? The bamboo sheets would make coming home even better. The Bamboo Sheet Set would make me happy to come home, but I also would like to try the sparkling juices. I would love to try the sheet set! I want cooler, lol – I have to be cool to sleep and I have heard great things about these bamboo sheets, twice as soft just sounds fantastic! Wow, I can’t just say one. At first I thought the antique marquis light, because how cool is that?! But I would also love the bamboo sheets for their softness, eco-friendliness, ability to stay cool, etc, and the sparkling juice (perfect because we don’t drink alcohol,) and the over-the-door organizer because I need more organization in my life and home! So I’d love all of them! Thanks for the great giveaways! I would love the bamboo sheets. I would love to come home to the Cariloha sheets. Mine are ripped. I love the vintage marquee light. It’s a beautiful unique decor that would always make me smile. Sheets. Definitely sheets. My bed is usually the first place I want to see when we get home from a trip–you know, a vacation from the vacation? I like the sheets and the stock it pockets. I like the organizer the most because I really need one. I would have to say the bamboo sheet set. Thank you for the giveaway! Oh, definitely the Cariloha sheets! Bamboo sheets are pure luxury!! The sheets would be the best to come home to! The Cariloha Bamboo Sheets are great prizes. The whole package is cool, though. I’ve been wanting to try Kristin Regale juices, so that’s another plus. Definitely the Bamboo Sheet Set would make me happy to come home to. I would like to try the Cariloha Bamboo Sheets. I would love the new Sheets. Oh Wow! This is really nice. Luxurious. I like the the Cariloha Bamboo Sheets the most. I would love to have the Cariloha Bamboo Sheets. I like the sheets the best. The sheets would be my favorite! My favorite – Vintage Marquee Light’s……They look really cool. The sheets look super comfy, but a marquee light in the den would be a cute way to welcome me home so I think that’s my favorite. I think I’d like the bamboo wear most of all. What fabulous prizes. I think the sheets.